With how well Daniel Mengden has pitched for the better part of the past month and a half, the Athletics may have felt like winning with him on the bump was as easy as getting one run. Oakland put that theory to the test Sunday at the Oakland Coliseum, and Mengden delivered. After a flawless top of the first from Mengden (W, 5-4, ERA), Matt Joyce crushed the first pitch he saw from Diamondbacks starter Clay Buchholz — a belt-high 92-mph fastball over the heart of the plate — for a solo homer (6). Joyce’s ninth-career lead-off homer was all Mengden would need, throwing just 102 pitches in two hours and 15 minutes for his second-career complete game shutout. The A’s (27-25) added two more for insurance on seventh- and eighth-inning homers from Matt Olson (8) and Chad Pinder (5), to hand Arizona (26-25) a 3-0 defeat. As has been the case throughout the month of May, and in all but one of his starts since April 11, Mengden had all of his weapons ready and sharpened. His 93-mph fastball was sharp, earning a swinging strike three from slumping All-Star slugger Paul Goldschmidt to strand the only Arizona runner to reach scoring position at third in the third. His low-70s curveball was fooling everyone, as was his changeup, and the slider was the finishing pitch on three of his four other strikeouts. In eight starts following a five-inning, three-earnie victory at the Dodgers on April 11, Mengden has surrendered just 10 earned runs, including four in a loss at Houston, in 50-1/3 innings. He has gone 4-2 in that time, with his A’s winning both games in which he did not factor into the decision. 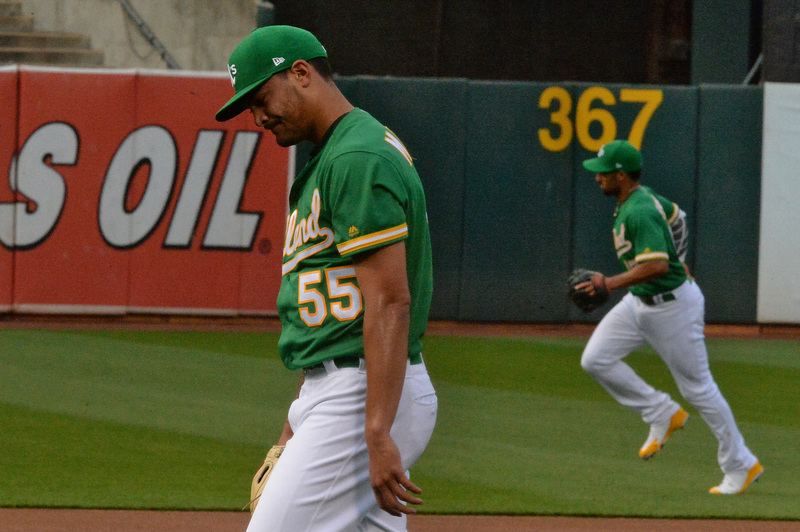 As important as getting the A’s back into the win column, Mengden, who was responsible for Oakland’s lone complete game last season, gave his bullpen a much-needed day of rest. Through the first 23 games in May, A’s relievers have been forced to take on 91 innings — about four innings per contest. The mustached hurler held an ice-cold Arizona offense to two hits, both singles, while striking out just five. He also didn’t issue a single free pass and has walked just six in his 66-1/3 innings this season — just two of those in May. That he said has been a focus of his this season, saying that goal number one has been to get ahead 0-1, then finish at-bats in three to five pitches. He accomplished both goals, throwing strike one to 23 of 30 batters faced (77 percent), despite throwing ball one to all thee batters in the eighth, and finished 26 of 30 at-bats (87 percent) in five pitches or fewer, including all three batters in a nine-pitch ninth. He didn’t need much but the Oakland bats, which have been in their own Arizona-esque slump at home this month, offered a trio of long solo homers in Mengden’s support. For Joyce, home run No. 5 as his club’s leadoff hitter is enough for a tie with Mark Kotsay in Oakland A’s history. He remains quite out of reach of Rickey Henderson’s 43. And Pinder’s eighth-inning blast, which carried only a few feet further than his double off the wall in the sixth, bought, as Melvin put it, Mengden a chance to finish the game. The skipper said that he would have gone to Treinen had his club’s lead been just two. But, having a three-run lead allowed him to let Mengden give it a go. Frankie Montas will be recalled from Triple-A Nashville to make Sunday’s start. Montas has made two major league starts in his career, going 0-2 with seven runs allowed in seven innings as a member of the White Sox in 2015. This season, the 25-year-old is 1-5 with a 4.39 ERA in nine starts with the Nashville Sounds, ending a run of three straight quality starts his last time out allowing five runs in five innings. He will face 2009 AL Cy Young Zack Greinke (3-3, 3.71 ERA) who carries 6-1 record and 3.12 ERA in 15 career games against the A’s. Santiago Casilla, who strained his right shoulder in the A’s 7-1 loss Friday night, was placed on the 10-day disabled list Saturday. Manager Bob Melvin said Friday that Casilla (0-0, 3.32 ERA) suffered a similar injury during Spring Training this season and was able to fully recover quickly, he expects the same with this injury. … Josh Lucas was optioned to Triple-A Nashville (0-0, 3.12 ERA) Saturday after allowing two earned runs in a two-inning spot-start Thursday. To fill the two pitching vacancies, the A’s recalled right-handed pitchers Chris Bassitt and Carlos Ramírez (0-0, 3.86 ERA). Bassitt spent six days with the A’s (April 20-26) but has yet to pitch in the big leagues since Tommy John surgery in 2016. He is 2-2 with a 6.35 ERA in eight outings (five starts) with Triple-A Nashville this season. Ramírez was selected off waivers from the Blue Jays on May 6 after appearing in two games with Toronto this season. He has allowed one earned run in 2-1/3 innings this year.